Game Of Thrones actors had a mini reunion in London after six years and they still seem thicker than thieves. The actors who play the ‘Great Rider’ Khal Drogo and ‘The mother of Dragons’ Daenerys Targaryen were spotted enjoying a night out in London as Jason Momoa was promoting his latest DC movie— Justice League. This picture comes in as a salve providing relief to the fans that are eagerly waiting for the series’ season 8. On the occasion of their impromptu reunion, the actress who will be next seen in a Star Wars spinoff shared a sweet photo on Instagram where they looked delighted to be in each other’s company again! When life is so good that your sun and stars is in your city…you lose your eyes and gain 5 grins ? (and gins) where until now they'd only been one… (*grins- there's always more gins) ? @prideofgypsies YOU ALWAYS MOTHER OF DRAGONS MAIN MAN ?? #lookoutjonsnowdrogosgotyournumber #happinessishere #hawaiianhakahunkoffunshutsdownlondon ???? 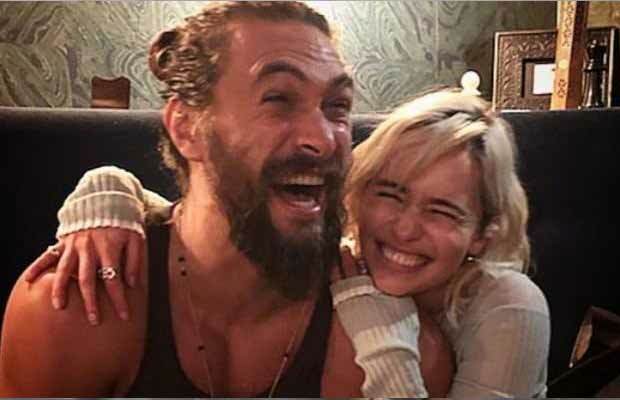 As soon as the picture was uploaded the Game Of Thrones fans started commenting on different social media platforms stating, ‘This is what pure joy looks like.’, ‘Drogo and Dani forever!’ and also that Khal and Daenerys were and are the only real Game Of Thrones couple. We hope any other still-alive couples of the show are not too disappointed by that statement. And, sincerely hope that Jon Snow (can we call him a Targaryen already!) hasn’t heard that statement! Reportedly, the producers and writers of the hit fantasy show— Dan Benioff and D.B. Weiss will be working on the final season for the next year and a half, rather than putting their name to any sequels. The wait for season 8 seems to stretch on as the author of the fantasy novels’ series; George R. R. Martin hasn’t finished writing the Winds of Winter. Probably the anticipated novel will not be out until 2019. Also, according to Inquisitr, George has been working on an off shoot of the popular fantasy series called Fire and Blood which will elaborate the history of the Targaryen family. This novel maybe released before Winds of Winter. Previous articleRanveer Singh Reacts On Ranbir Kapoor’s Viral Pics With Pakistani Actress Mahira Khan!